At 11 a.m. ET Thursday morning, Nokia(s nok) is holding a press event where it’s expected to unveil the Lumia 1020, the company’s latest flagship phone running Microsoft’s(s msft) software. But you don’t have to wait until then to get the details of the handset. Video promotions for the phone on AT&T’s (s t) network went live early and Engadget caught sight of them. The videos are marked private for now; if you want to see them, Engadget downloaded them for your viewing pleasure. And since I’m in New York City about to walk over to the event, I watched them to get a preview of the new hardware. In summary: the many rumors and leaks of a 41 megapixel Windows Phone 8 device are ringing true. The handset will offer 720p video capture with a 6x zoom feature and stereo sound recording; I suspect it will support 1080p video as well. Optical image stabilization, Zeiss optics and a large backside illuminated sensor all contribute to the camera technology. Obviously, there’s more to a phone than just the camera. At the event, we’ll hear about the Windows Phone software, perhaps some exclusive Nokia apps, and which carriers will carry the phone, unless this becomes another AT&T exclusive, which is likely. 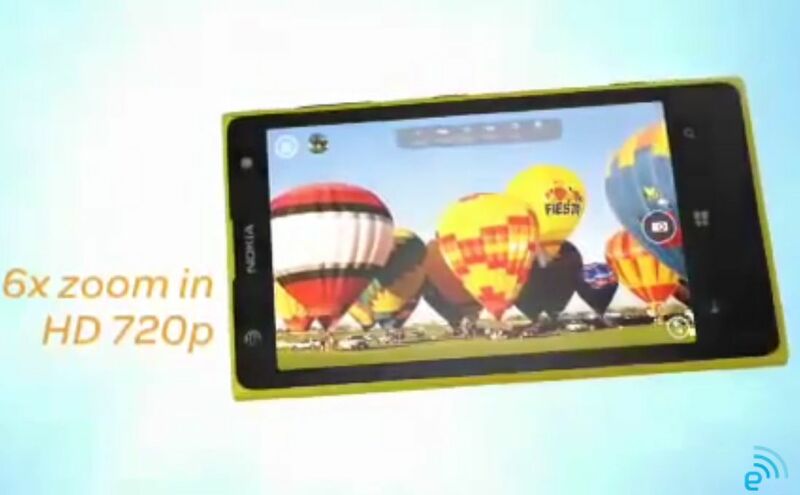 Make no mistake though: the crown jewel of the Lumia 1020 will be Nokia’s PureView camera technology built into a phone with a capable operating system.